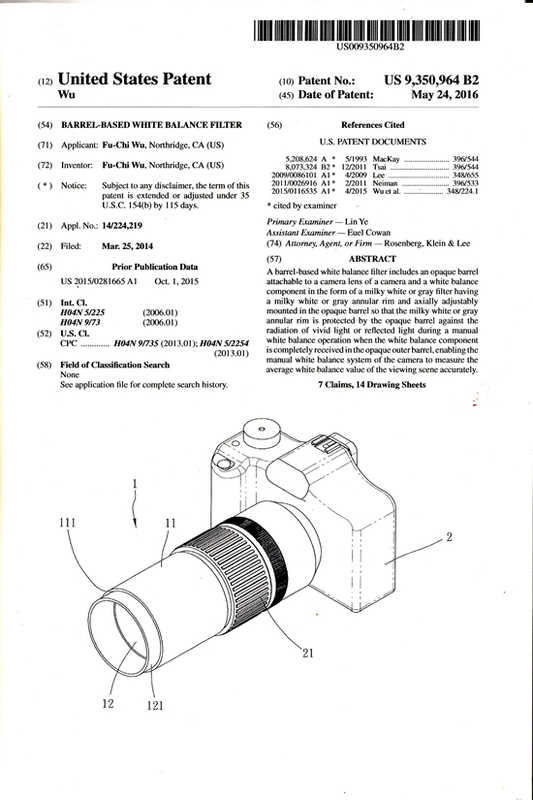 We are pleased to announce that Directivity White Balance Filter, based on the innovative optic physic design, have been awarded by U.S Patent No. 9,350,964 valid for 20 years. The Directivity White Balance Filter is used to select the light rays in limited range to calibrate the camera grey card system to the photo/video scenes for true color works. It is the only solution to shoot for almost perfect color photo/video either indoors or outdoors. Based on the right physic optics theory, it works much better than any other white balance tools in history. The Patent can be applied on independent filters or on camera/camera phones directly to resolve their constant annoyed color casting problems. Any party is interested in licensing, please contact with.